Atarimax Product Discussion Forums • View topic - USB Cartridge Programmer and Maxflash Studio Now Available! USB Cartridge Programmer and Maxflash Studio Now Available! Post subject: USB Cartridge Programmer and Maxflash Studio Now Available! 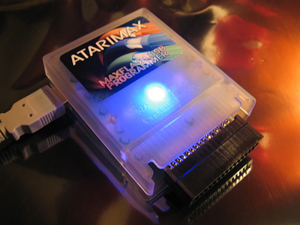 The Atarimax USB Cartridge Programmer and Maxflash Studio Software are now available! 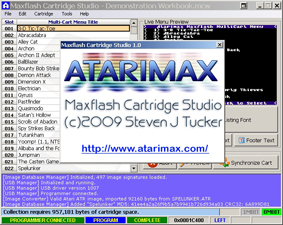 The Maxflash Studio Software includes a built-in recognition database of over 1200 of the most popular games, letting you drag and drop nearly any game program file into your cartridge workbook and have it work the first time, every time, without fussing with advanced configuration settings. The USB Cartridge Programmer Kit is available for Pre-Ordering now, with shipment on or before 09/15/2009. The pre-ordering price for the USB Cartridge Programmer Kit is priced at $59.99 plus shipping. The Maxflash Studio Software is available for download now at the URL above. This software also works for ISP programming via SIO2PC, so it is a free major upgrade for all current Maxflash cartridge owners, even without the USB interface! question: Can it also program the myide+1mb flashcartridge? It can program the entire boot flash from the ATR programming image made with the scripts, or save a copy of the boot flash, but the dynamic menu creation is not supported yet for MyIDE+Flash. Can this cartridge be used to dump Atari 2600 and 7800 cartridges, with an adaptor? I see you have them for the Coleco and Intelevision. There are no dumping adapters for the 2600 and 7800 as of now. I may add them in the future though. If you decide to build more adapters one for the 5200 would be nice as well. Im getting back to wanting to program my original 8mbit Atarimax carts - how can I do this? I cant find anything to program a bin image I was given for testing. I remember before having an ATR to boot which would then load the image on to the cart but I cant seem to find this anymore? 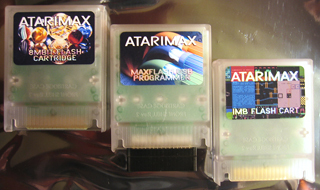 Did you find info on programming your 8Mb Maxflash carts? If you still need help, let me know. I've been putting together info as I'm just starting to program for them, as well. Any idea what settings I should use to get Assembloids XE to run on my MaxFlash USB Programmer? I purchased the Max Flash USB programmer a long time ago and love it. My original computer that I have the software installed on has several issues with it now and I would like to install the software on my current desktop. The problem is that when I moved five years ago, I have the usb hardware but not the CD anymore. Is there a way to download the Maxflash studio software? Edit - Never mind, I found the installer. Hey Kids, you cut that crap out! You wouldn't do this if Nixon was in the Whitehouse. Come on, I'm the walrus.